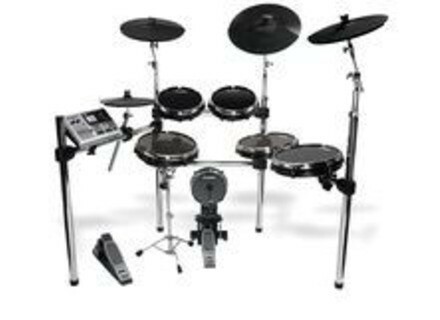 DM10 X Kit, Electronic Drum Kit from Alesis in the DM series. 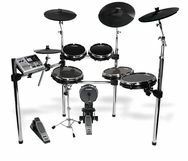 The DM10 X Kit is a six-piece electronic drum set that features large RealHead drum pads, large DMPad cymbals and a chrome-plated Xrack with release clamps. The DM10 X Kit features a six-drum, four-cymbal configuration : a 12-inch snare, two 10-inch toms, two 12-inch floor toms, a 12-inch hi-hat, a 16-inch, three-zone ride cymbal and two 14-inch crash cymbals. The DM10 X Kit’s Xrack is chrome-plated and features a four-post design. Alesis release clamps secure each pad in placet. The DM10 X Kit’s snare pad comes with a separate, adjustable snare stand. With the DM10 X Kit, Alesis unveils a new-look DM10 module, which contains 1,000 sample-based sounds that were produced using Alesis’ Dynamic Articulation technology. Pearl Maracabasa The Maracabasa is a new percussion accessory from Pearl Percussion, combining the functionality of a maraca and a cabasa in one hand-held instrument. Pearl EZ-Tune Djembe Pearl’s EZ-Tune Djembe is a djembe designed to combine the look and feel of a rope djembe with the modern functionality of a mechanical tuning system. Pearl 2Face Cajon The new 2Face Cajon from Pearl Percussion has two distinct personalities, according to the company.